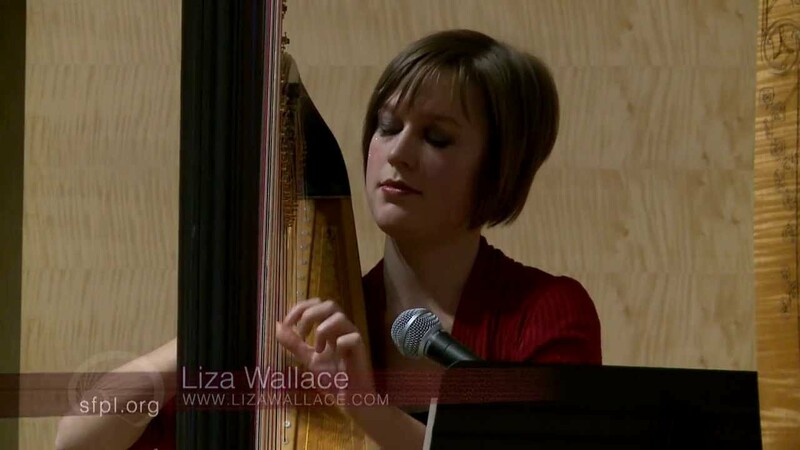 Solo Performance of original arrangement; "Quitapesares/Autumn Leaves"
Original song "Into Your Heart"
Add vibrancy and elegance to your event with the music of Liza Wallace. 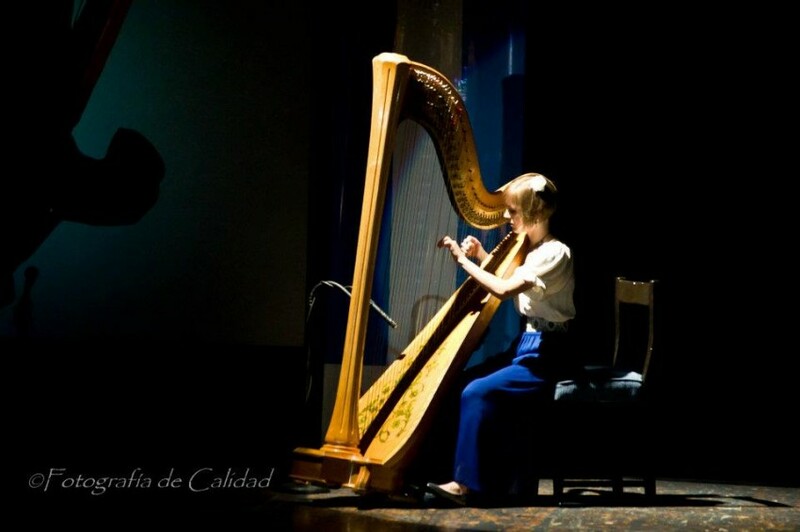 As a harpist, singer, and composer, Liza offers a unique repertoire including classical, jazz, latin american, pop, and folk styles. A seasoned performer, Liza can bring entertainment as a solo act and/or create a beautiful and relaxed environment with background music during cocktail hours, dinners, and more. Liza plays lovely music and sings like an angel! 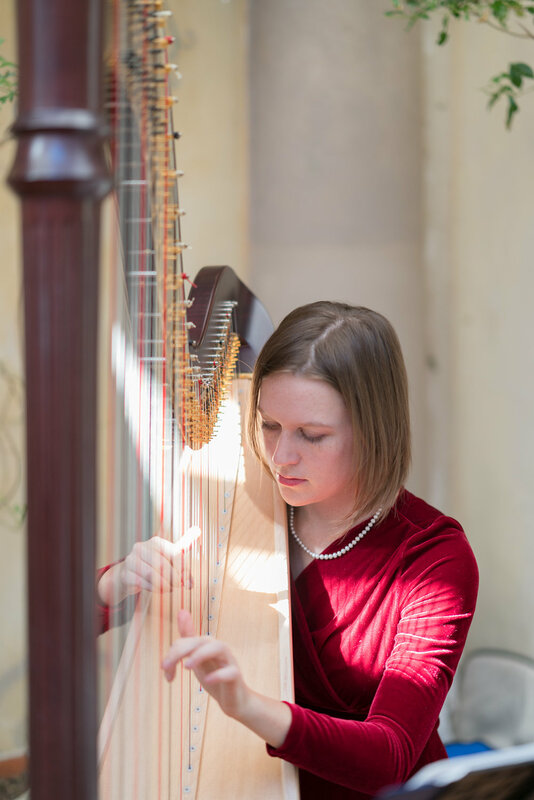 Liza played at our wedding cake reception; she played the loveliest background music and sang like an angel. We hosted it at our home and having Liza there added a touch of elegance that was just perfect. There are not enough words to express how happy and grateful we were that she was free to play at our gathering. The fact that she also knows latin american music and was super pleasant and professional to deal with was a huge bonus. Her performance was magical, it will stay with us always. Our guests were impressed and we can't thank her enough for an outstanding job! Truly priceless. 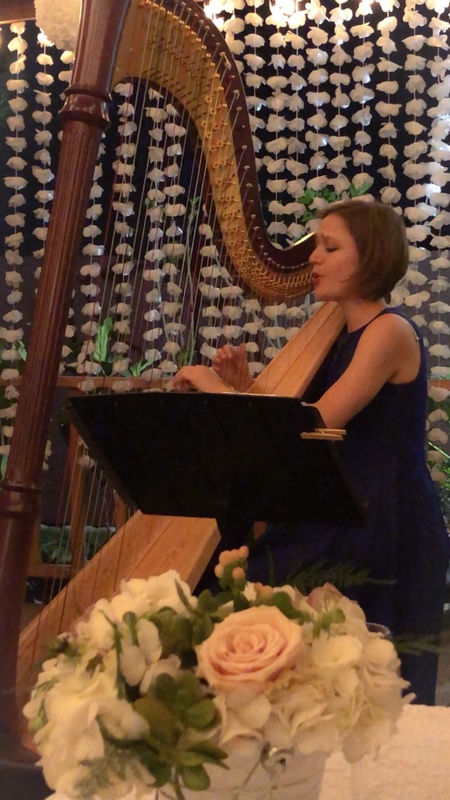 Ms. Wallace recently played at our daughter's wedding and reception. She was professional and very talented. She responded quickly to our daughter's choice of music and spoke with her in advance of her ceremony. 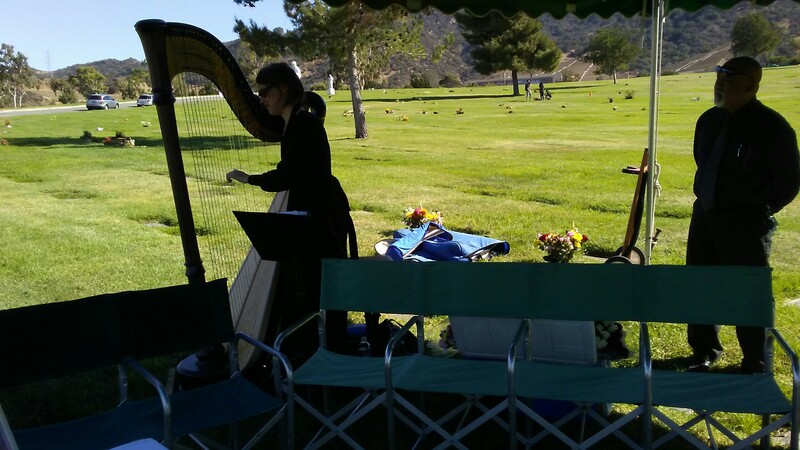 I was surprised to learn of Ms. Wallace's vast repertoire of music and how positively she responded when asked to play songs from the Beatles on her harp during the ceremony. Our family and friends all mentioned what a beautiful bonus she was to both wedding and reception and how much they enjoyed her. I found Liza through GigSalad and was so happy we did. She was prompt and professional from our first point of contact and was very easy to communicate with through GigSalad messaging. She arrived on time, her set up was easy, and she even wore a dress in the color of our theme. 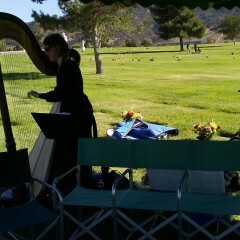 Her harp playing and singing were absolutely beautiful. I would highly recommend Liza Wallace for any event. Thank you! Liza performed soft jazz with vocals as background for an upscale dinner party. She is extremely talented and professional. We highly recommend! She fulfilled all our needs, providing delightful music and song, just loud enough and not overpowering. 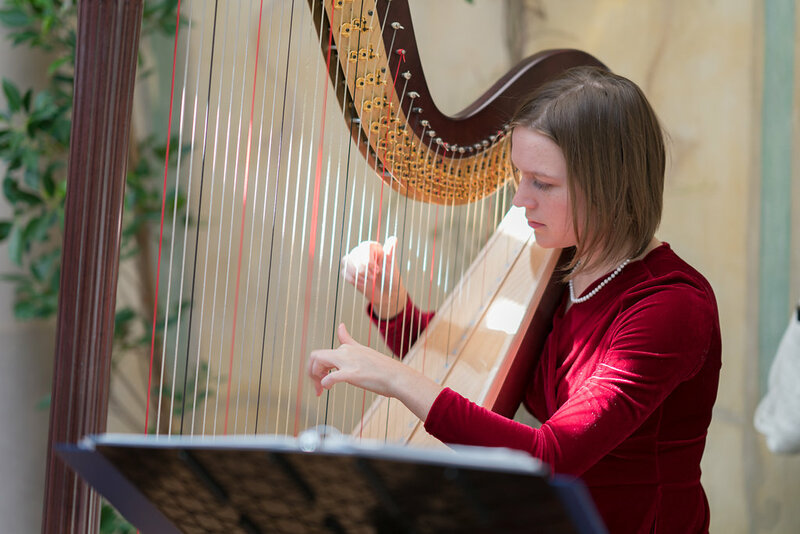 Liza brought the right touch of class to our yacht club event as a harpist. She was friendly, on time, brought her own equipment, and played the entire time allocated. She even dressed up to match our "all-white" theme. 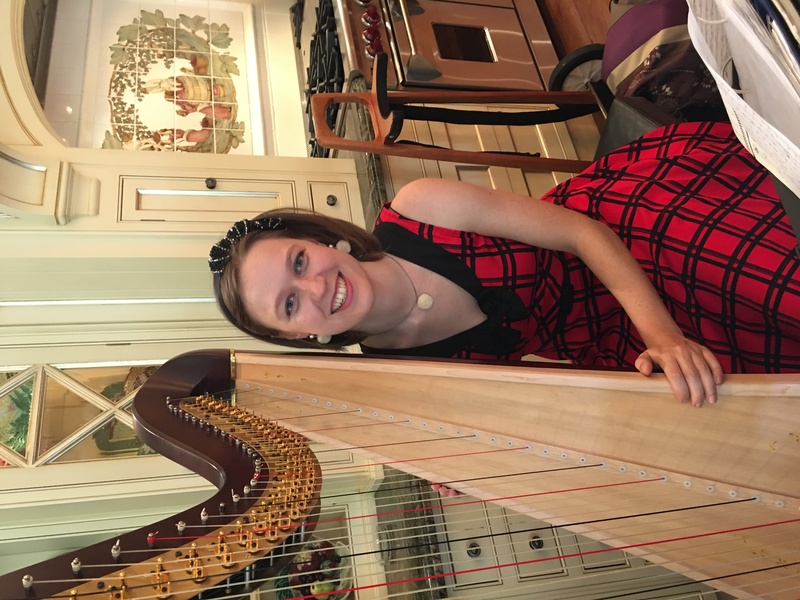 She really knows her craft — playing and singing a combination of familiar tunes and bossa nova on her harp. I will definitely book Liza again. Highly recommended! Liza, has such an angelical voice, presence, absolutely beautiful. Looking forward to our next event to hire Ms. Wallace. Liza was wonderful, f,exuberant, and had a.
I had the privilege of having Liza Wallace provide the music for my daughter’s St. Patrick’s Day wedding. She was the utmost professional: highly skilled, well prepared, willing to learn a specific piece, worked well with our other musicians, flexible, punctual, and just all around lovely. My daughter was thrilled with the music and our guests were impressed! Liza played the most graceful songs and gave everyone the feels. She even sang some 60's folk songs which was delightful. Really wonderful. Liza did an amazing performance in our ceremony. If I have another event that can use her services, I'd love to have her back. Flat out amazing! Liza is a sweet lady. She went above & beyond with my requests. We added a violin and they did amazing! Simply beautiful touch for our ceremony. I arrived late to the ceremony and I am thankful that they were so professional and they played according our request, never rushed. Thank you so much again Liza for being part of our special day. 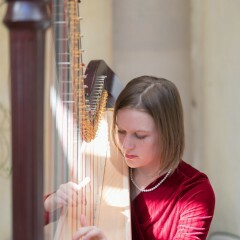 I am very pleased with Liza's skill as a harpist and she sings like an angel. She found the special song requests made by my Mother for her 85th birthday celebration, two of which were a rare find. Not only did she play them exceptionally well, she sang them for us, which was truly a blessing for my Mom. Liza did a phenomenal job, and I really appreciate her. I most certainly will request Liza for future events. I think Liza did a spectacular job at my daughter's wedding. 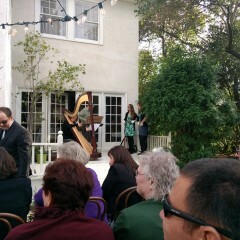 She was very organized throughout the process and everyone raved about how beautiful her music was before the ceremony. I would recommend Liza to anyone looking to have music at your dinner party, cocktail party or special event. She made our daughter's wedding very special and I can't thank her enough. Liz Wallace was outstanding! Her poise and charm impressed everyone. 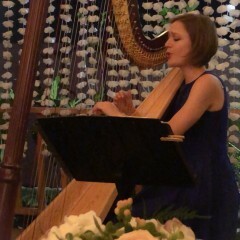 Liza played soft harp music throughout The High Tea. In addition, she sang and presented a few songs for the group! We were very impressed with her expertise and would highly recommend Liza. Overall, Liza did well. She played through the agreed time. 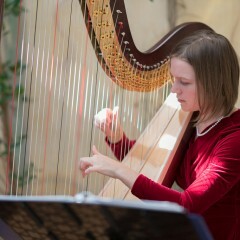 She was prompt and a great harpist player. My guests were entertained. Thank you, Liza ! Liza helped create a really unique ambiance for my event. She was professional and showed up on time. She even took a request. Thanks again Liza! You rock! Lisa turned up 30mins in advance of her appointed time and setup. 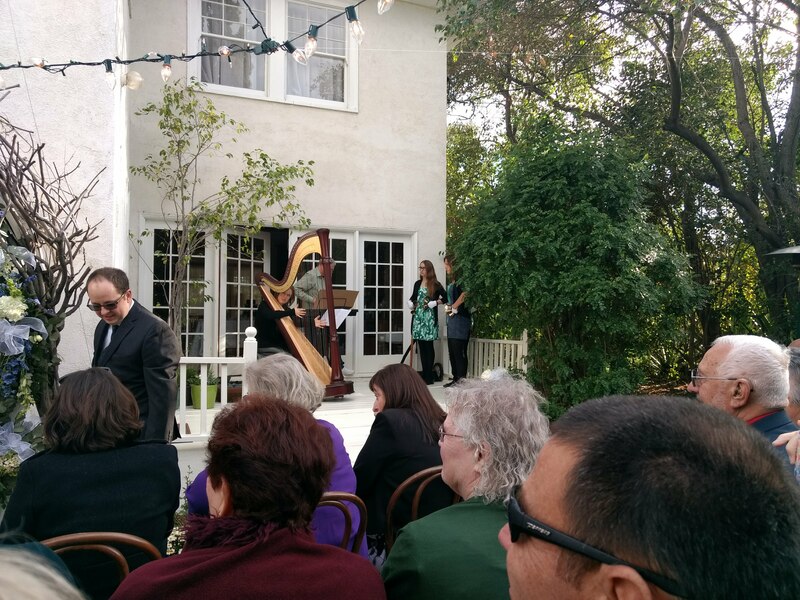 As soon as guests started to enter she began playing and did so for the duration of the party. Everyone complemented how nice the music was. Thanks Lisa - definitely recommend. Liza Wallace gave an amazing performance at The Hollywood Heritage Museum. 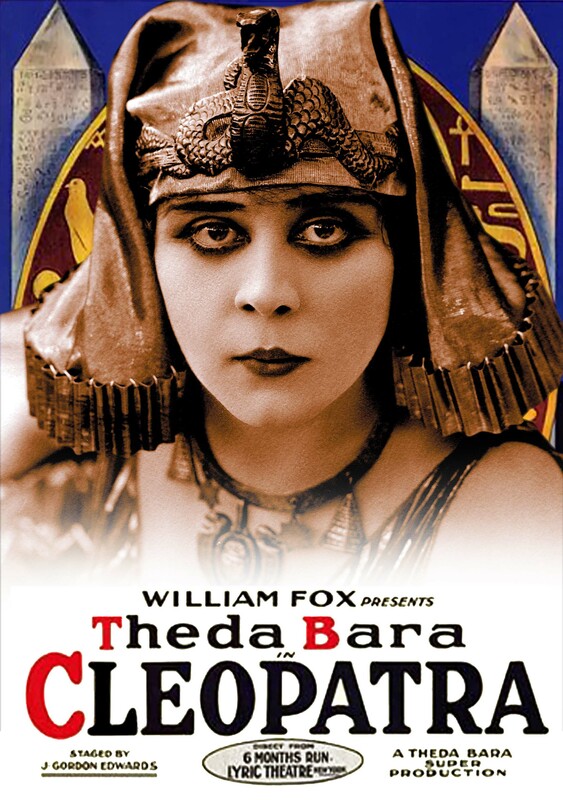 Challenging conditions that she handled with grace... She was playing opposite a piano scoring a silent film (1917) Theda Bara's Cleopatra essentially on the spot. The audience was so happy. 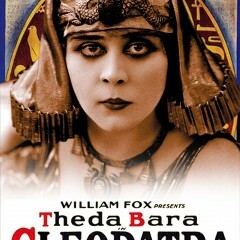 I look forward to working with her again! We loved her, excellent musician, inquired about songs to play for my mom's Birthday. Even sang, very reasonable price! Liza is professional, friendly, and was a real pleasure to have perform at our library Christmas party. Would love to have her again! I'm so happy that I found Liza on GigSalad. Her music and vocals were the perfect addition to the atmosphere at my mom's 80th birthday celebration. Can't wait to plan another event and include Liza! Liza Wallace's presence and professionalism made my baby shower all I had hoped for. Her repertoire was perfect, she arrived prepared & early. I highly recommend her. Liza responded very quickly to my request for a singing stringed-instrumentalist for my Mother's memorial, and she proved to continue to respond to emails promptly. She came well prepared and professionally dressed, and had learned the songs and music I had requested and led the family in an unforgettable sing-along. My relatives loved the music, and I felt it provided a wonderful dimension to our celebration of life. Liza is a great performer .. would use her again and will recommend her to others... she put a lot of feeling to the bolero I requested for my mother..
Liza was great. She really added something special and unique to the party vibe. People were very drawn to her beautiful sound, but it also wasn't over-powering to distract from conversation. Highly suggest her for any party. Amazing. Thanks Liza for a wonderful night. She came ready and early on the day of my event. Her music is wonderful. Her voice is very angelic. She is very professional and inspite of loud noices from my guest, she continued to play for us. I requested songs for her to play and she played them so well. I cannot express how grateful I am that she played for me on my special day. She is highly recommended. service together, Liza had a very professional sense of the timing of things, and it was perfect. Highly recommend this young lady! 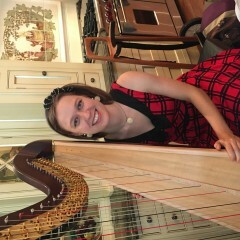 I was so happy with Harpist and Singer Liza Wallace. She communicated with me to plan the music for the wedding ahead of time. She arrived early and played beautifully. I RECOMMED LIZA without hesitation. At our wedding ceremony and reception Liza played from classical music to tangos and boleros. We had a great experience from beginning to end. She is very professional and punctual. 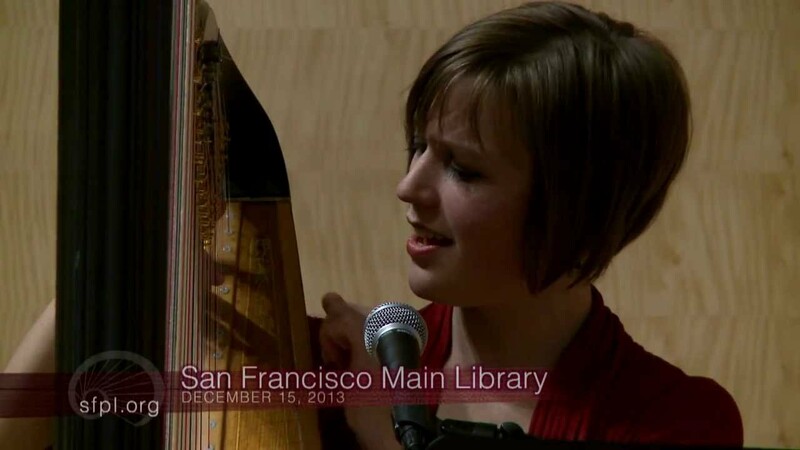 As a soloist and ensemble musician, Liza brings a new dimension to the harp’s role in contemporary music, striving to expand the possibilities for this unique instrument in Jazz, Folk, Latin, and World music. She grew up immersed in the vibrant musical culture of the San Francisco Bay Area and now is based in Los Angeles. 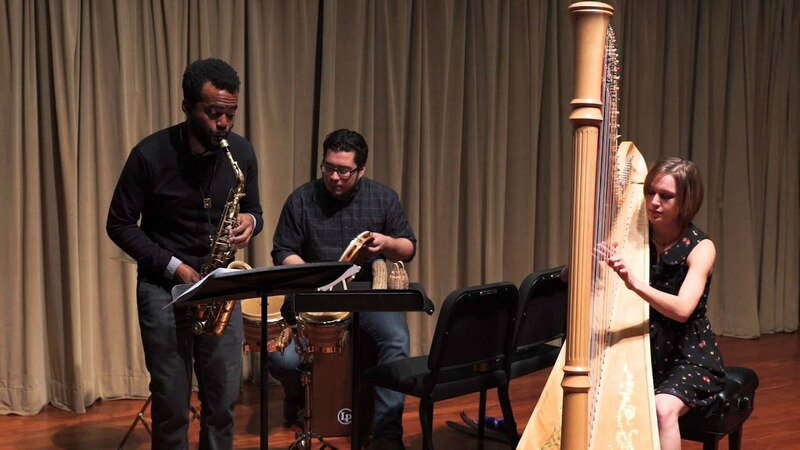 Liza’s music draws from the rhythmically passionate music of Venezuela, Brazil, and Cuba and the melodically enthralling music of North American Jazz and Folk traditions. Her compositions and arrangements synthesize these styles, creating a diverse musical experience meant to inspire laughter, tears, and dance! Liza has produced two albums, "Carousel" and "Waken", and worked as a recording artist for many ensembles. She has toured North and South America as well as Europe, sharing her music with a global community. Most recently, she travelled to Valle de Bravo, Mexico to perform in the Festival de las Almas. Liza has worked and performed with such Grammy award winning artists as Pop icon Sir Elton John, Salsa composer/pianist Gonzola Grau, Musical Theater star Kristin Chenoweth, Tango bassist Pablo Aslan, Jazz singer Silvia McNair, and Flamenco guitarist Adam del Monte. Liza holds a Master of Music from University of Southern California Thornton School of Music with High Distinction and a Bachelor of Music with High Distinction from Indiana University Jacobs School of Music. In 2012, I.U. awarded her the Performance Certificate for outstanding musicianship and performance ability.